Arugula is something that we always have in our refrigerator. The aroma gets us hooked to it. No matter what recipes we use, that amazing peppery taste is always there. Last Saturday, we picked up a small eggplant when we were at the farmers' market. I thought it would make a good combination with arugula. 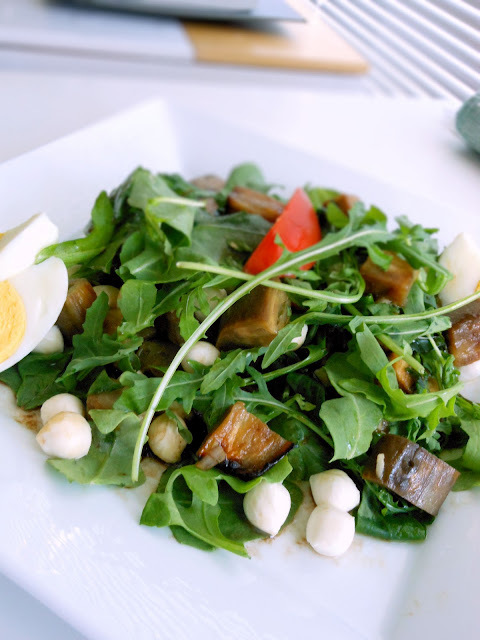 So last night we had arugula eggplant salad on our dinner menu. I like eggplants grilled, but I never use our grill because I am afraid that I would start it the wrong way. So my husband is the one using it. When he is not home and when I need to make something that requires grilling, I will find other alternatives. Yesterday, I used the oven to grill the eggplant. It was quite delicious. I didn't find it taste much of a difference from using the grill. I like to make my own salad dressings with garlic infused oil. If you want to try making your own garlic infused oil, make sure you do it properly so that you won't get poisoned. Keep the oil in the refrigerator no more than a week. 1 eggplant - 8 oz. Peel the eggplant. Cut lengthwise into 1/2" thick. Place sliced eggplant on a baking sheet. Drizzle olive oil and teriyaki sauce over the eggplant. Add chopped garlic. Broil each side for 5 minutes. Let cool. Cut broiled eggplant into cubes. Set aside. Add garlic to the oil. Saute for about 1 minute or before it turns brown. Add chopped basil. Remove from heat immediately. Let cool. 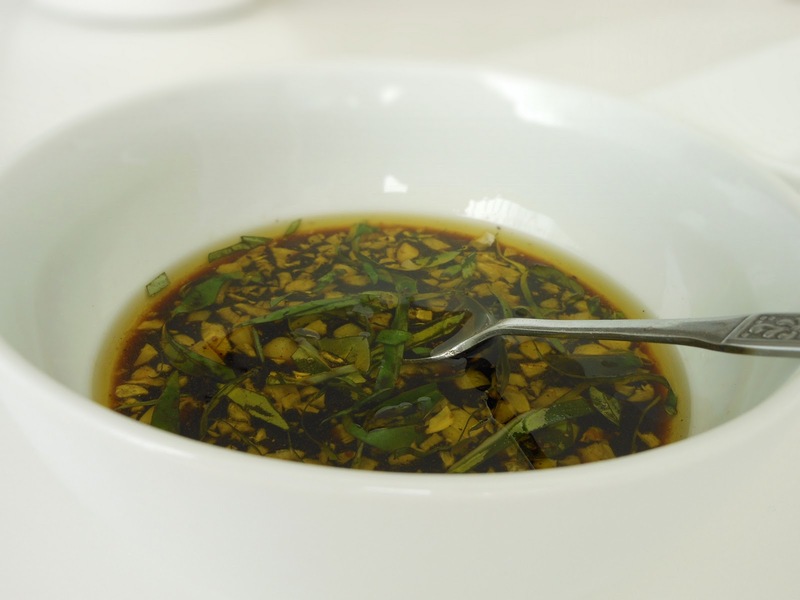 Mix the garlic infused oil with honey and Balsamic vinegar. Place the baby arugula on a serving plate. Put the eggplant over the arugula. Add bocconcini pearls, egg and tomato. Drizzle the Balsamic vinaigrette over the salad and serve.